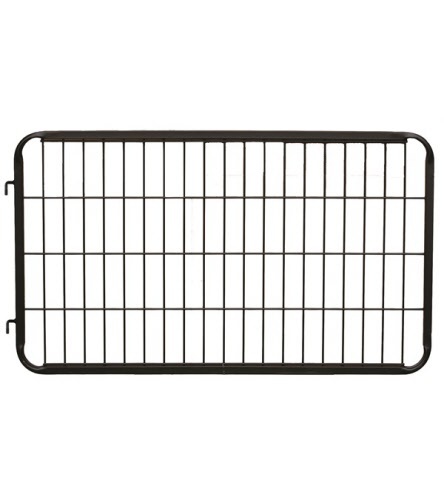 << Back Show Gate 32"x 52"
Made in USA. Designed to provide maximum visibility and ventilation with dependable security. Fabricated using 1" square structural steel tubing and 1/4" steel wire. Built to last - 25% stronger than equivalent round tubing. Heavier gauge steel than imports. A "foal friendly" close mesh profile gives horse owners peace of mind when securing valuable and treasured animals. Powder coated finish. All gates have threaded hinge pins. Nuts can be installed to prevent animals from lifting the gate. Hinges included. 32" high x 52" wide (standard width for 55" openings).